A spy novel? Maybe, but still a valid strategy for attempting to prove that Bing is poaching search results. Around late May of last year, Google told me it began noticing that Bing seemed to be doing exceptionally well at returning the same sites that Google would list, when someone would enter unusual misspellings. Do Internet Explorer users know that they might be helping Bing in the way Google alleges? Technically, yes — as best I can tell. Explicitly, absolutely not. While most will probably remain unaware of this aspect during the brouhaha, it does reinforce concerns about the usage of our private data. It often seems that, like texting while driving, people are aware of the problem and dangers but tend to ignore them for reasons of convenience. I went back and asked the Bing folks again, noting that I couldn’t figure out if this was a verbose way of admitting Bing was copying or a denial. We use over 1,000 different signals and features in our ranking algorithm. A small piece of that is clickstream data we get from some of our customers, who opt-in to sharing anonymous data as they navigate the web in order to help us improve the experience for all users. To be clear, we learn from all of our customers. What we saw in today’s story was a spy-novelesque stunt to generate extreme outliers in tail query ranking. It was a creative tactic by a competitor, and we’ll take it as a back-handed compliment. But it doesn’t accurately portray how we use opt-in customer data as one of many inputs to help improve our user experience. I’m sure that we will be seeing many more salvos back and forth between the two companies as the next few weeks unfold. 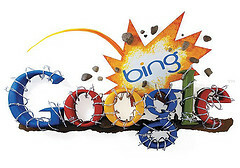 At this point though, it would seem that Bing is the one taking a blow to its reputation.